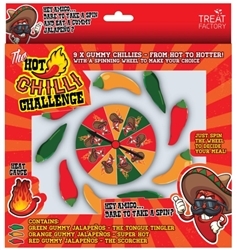 Hey Amigos dare to take a spin with The Hot Gummy Chili Pepper Challenge? Nine gummy chili peppers that range from hot to hotter to extreme hot. Contains 3 levels of heat: The Tongue Tingler (Green), Super Hot (Orange), The Scorcher (Red). Just spin the wheel to decide your fate.